A big thanks to yesterday’s presentation attendees for making yesterday’s event successful. We’ll be doing more in the near future, so please join our mailing list for updates. 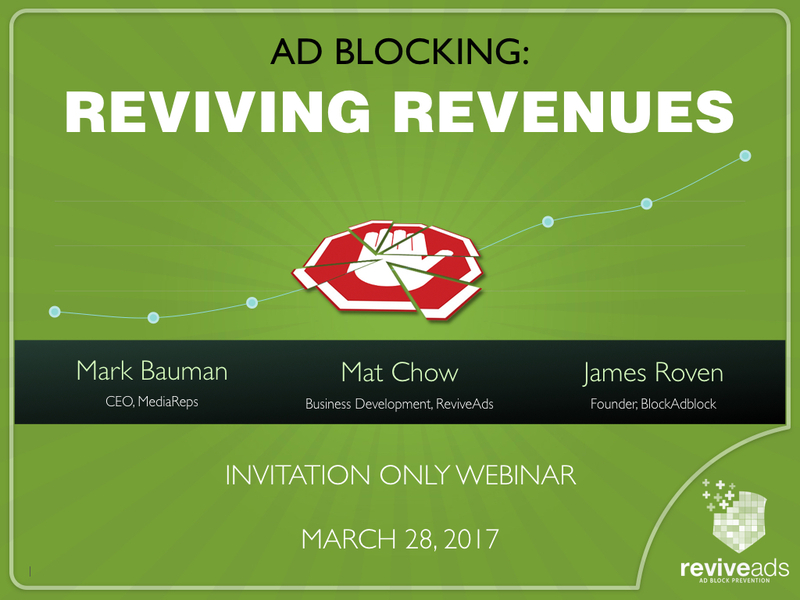 The webinar featured Mark Bauman (CEO, MediaReps), Mat Chow (Director of Business Development, ReviveAds), and James Roven (Founder, BlockAdblock). 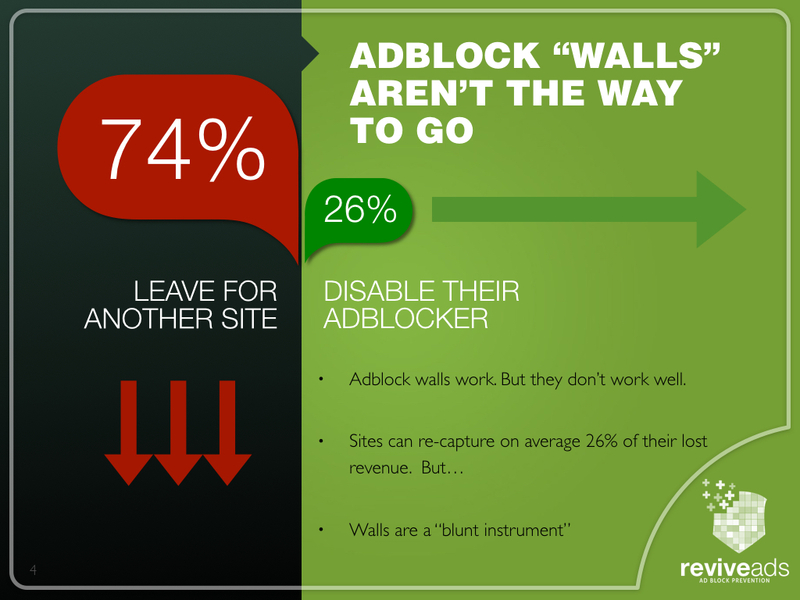 The trouble with Adblock “walls” is that on average, they send 74% of your adblocked traffic away. On one hand, that’s good news: You’re successfully remonetizing 26% of your adblocked traffic. 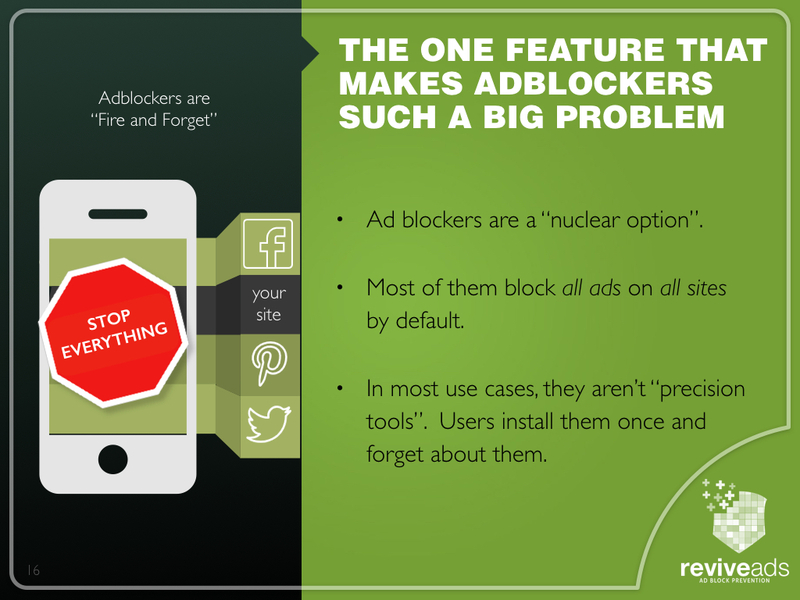 On the other hand, losing 74% of your adblocked traffic isn’t a great idea. 2. 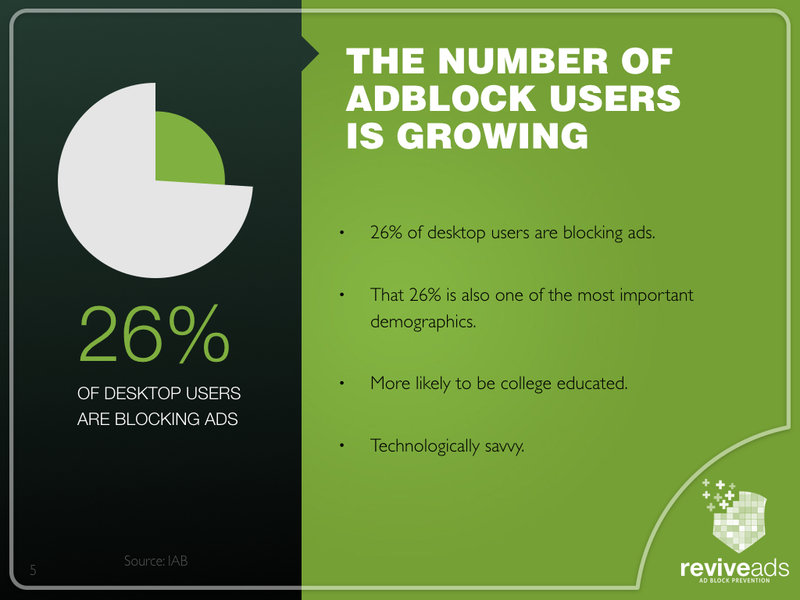 26% of desktop users are blocking ads! According to the IAB, around 26% of your desktop users are blocking ads on average. While that number is already bad enough – it’s actually worse than it looks. That 26% represents a highly educated, technologically savvy demographic. It’s one of the most sought-after market-segments for advertisers, and it’s becoming more difficult to reach in terms of viewability. 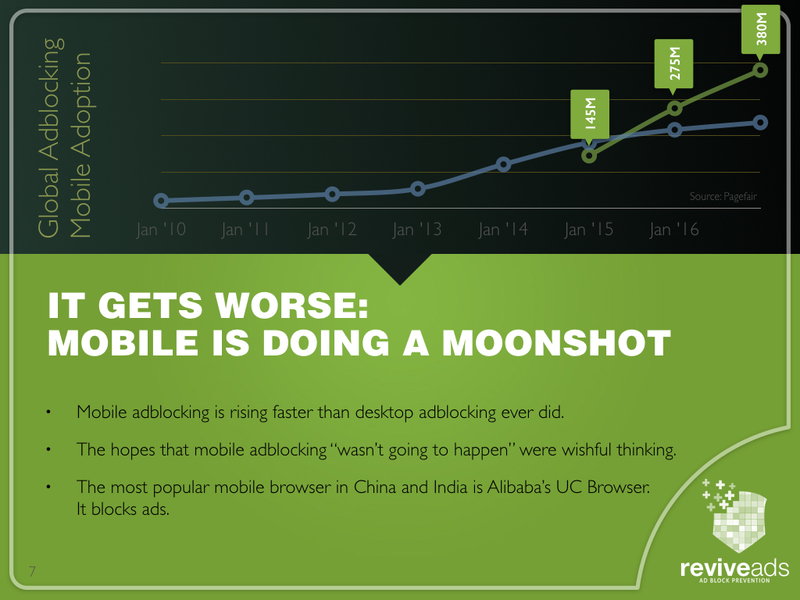 Remember about a year ago when pundits were proclaiming that mobile adblocking just wasn’t going to happen? Well… it did. It’s now growing faster than desktop ad blocking ever did. The most popular browser in India and in China is UC Browser. It blocks ads by default. Because adblocking is primarily a younger, male, tech-savvy phenomenon — video game sites are getting hit particularly hard. Mainstay video game portal IGN has an ad blocking rate of 40%. 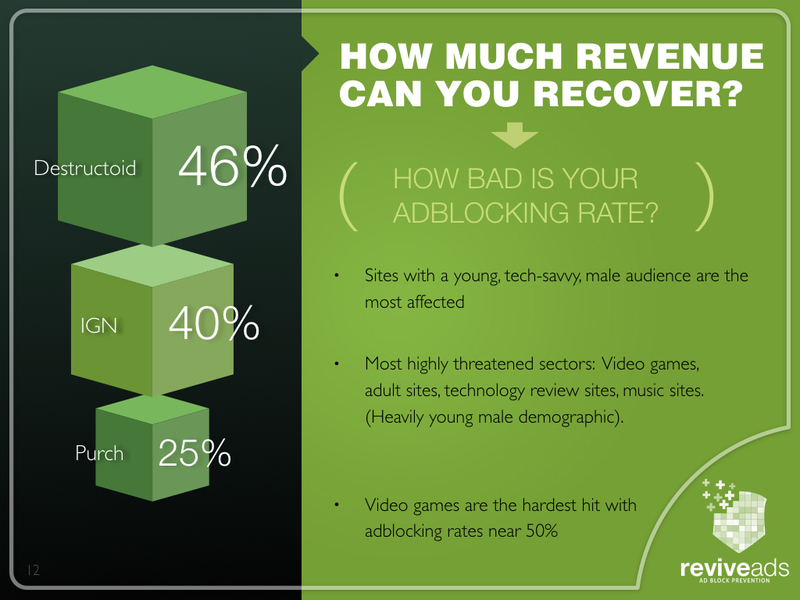 While the ever popular “Destructoid” has an ad blocking rate of nearly 46%. How many businesses can sustain those kinds of losses? One of the reasons ad blocking is so destructive is that it blocks the good ads along with the bad ads. Sites that are actually being respectful of the user experience also get ad-blocked. Ad blockers are not “precision tools”. We’ll continue this presentation re-cap in another post. Stay tuned!